PRIZES (4): One (1) mark. 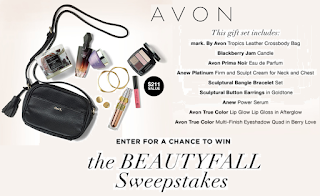 By Avon Tropics Leather Crossbody Bag, One (1) Blackberry Jam Candle, One (1) Anew Power Serum, One (1) Avon True Color Multi-Finish Eyeshadow Quad in Berry Love, One (1) Avon True Color Lip Glow Lip Gloss in Afterglow, One (1) Anew Platinum Firm and Sculpt Cream for Neck and Chest, One (1) Bangle Bracelet Set, One (1) Button Earrings in Goldtone, One (1) Avon Prima Noir. Approximate Retail Value (“ARV”): $211.00.